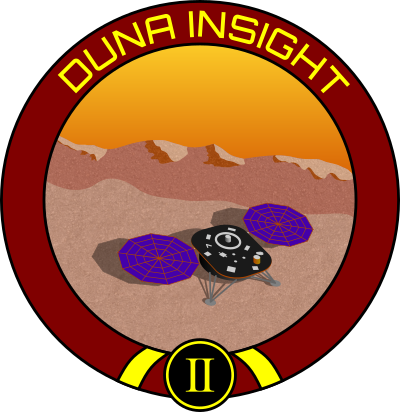 NASA recently landed its InSight probe on Mars to study its interior. 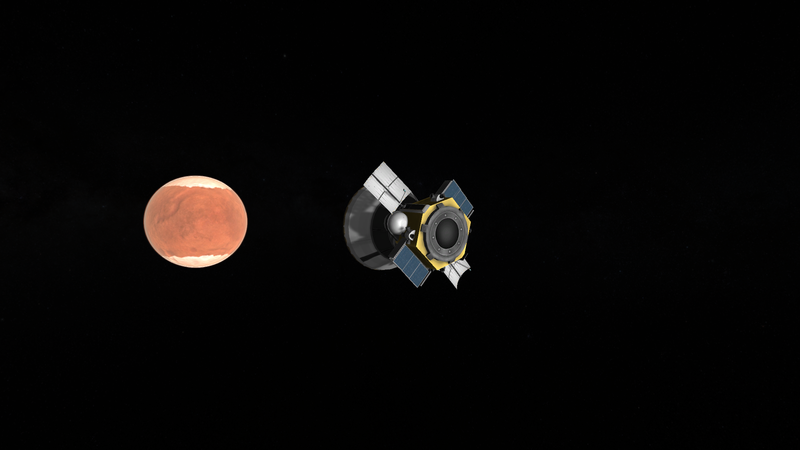 Tagging along behind are two CubeSats intended to record InSight during its landing sequence, and to act as a relay while the already-in-place Mars Reconnaissance Orbiter is out of position. So, onto the challenge! This is my first time running one, so please let me know if anything seems unclear or whatever. 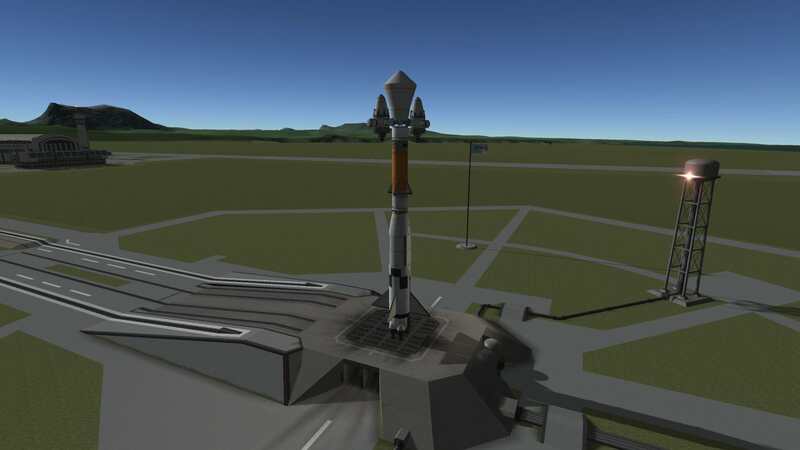 Your submission should include screenshots or video demonstrating each important phase (launch, transfers, landing, science transmission, flybys, etc.). For Rank 2 and up, you must use CommNet at the default settings. Part of the challenge at higher ranks is to demonstrate the ability to build a network. 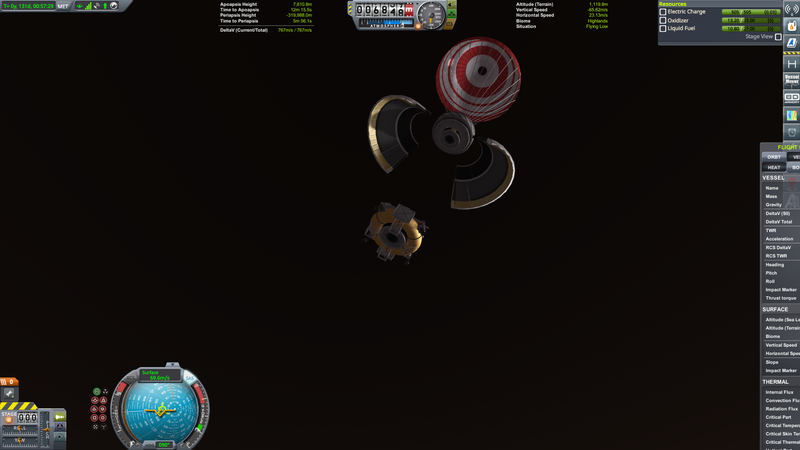 Note that at Rank 1, you still need an antenna capable of transmitting science data back to Kerbin, even if CommNet is disabled. To earn a rank badge, you must meet the requirements of that rank and all the ranks below it (except where noted). So if you want that Rank 4 badge, you also have to fulfill Ranks 1, 2, and 3. Please note whether your entry uses stock or modded parts. No FTL or other super advanced or exploit-based propulsion (kraken drives etc.). No HyperEdit or other cheats for anything related to scoring (ok for testing or additional infrastructure unrelated to mission objectives). Autopilot and other flight assistant mods (MechJeb, Throttle Controlled Avionics, etc.) are ok, but it must be possible to fly all craft manually. The intentionally terrible VTOL craft in the TCA intro video would not be allowed, for instance. 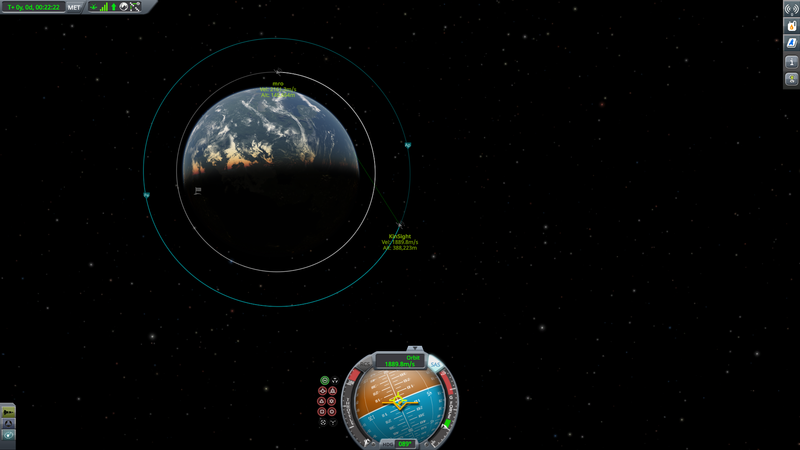 Planet packs should not alter the stock planets' parameters, for scoring purposes. If you are really enthusiastic about GPP or whatever, maybe we can work something out, but I'm not really familiar with those. Other mods allowed, as long as it's not too outlandish. No refueling. 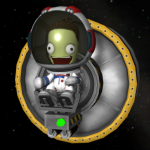 ISRU is allowed if you are attempting some sort of Jeb madness (see below). If you are playing for bonus science points, you may not use labs, contracts, difficulty settings, or other means to multiply the science gathered. Only default points from experiment + body + situation count. 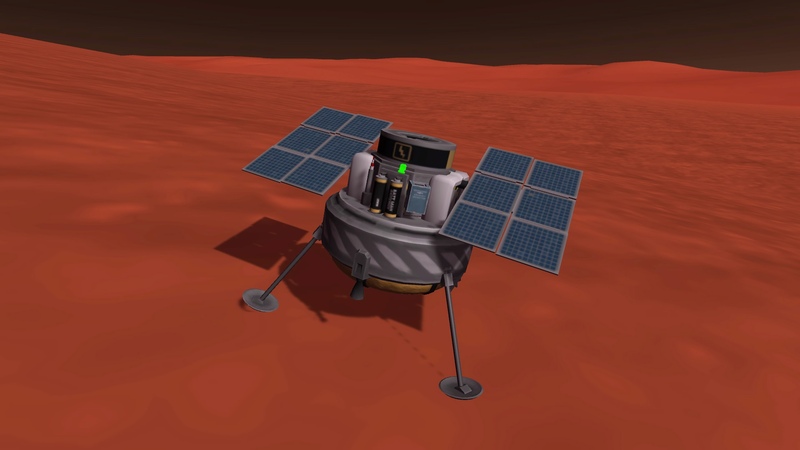 Build an unmanned lander capable of reaching Duna's surface. 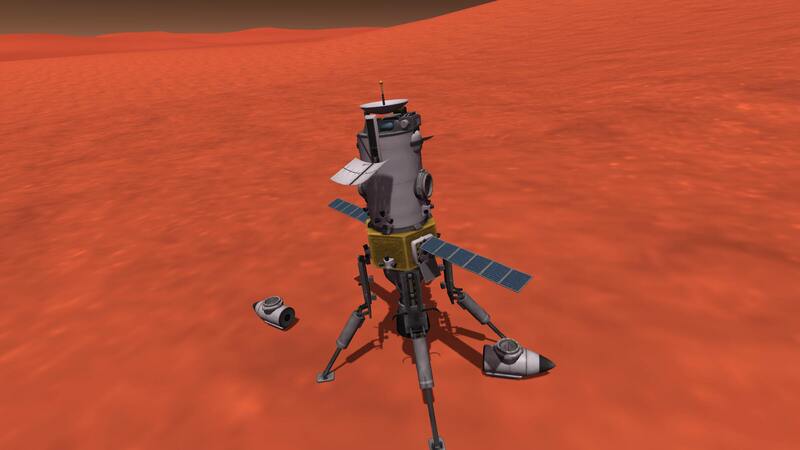 The lander must include a thermometer, seismic accelerometer, and negative gravioli detector. 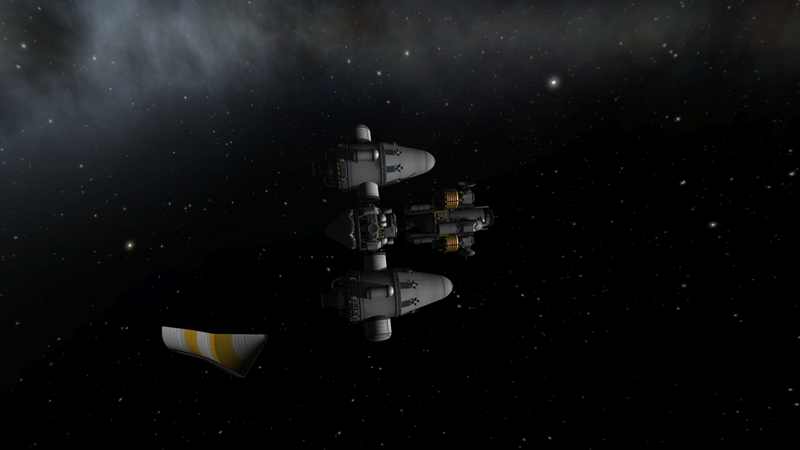 It must also include sufficient solar panels and antennas to transmit its data back to Kerbin. 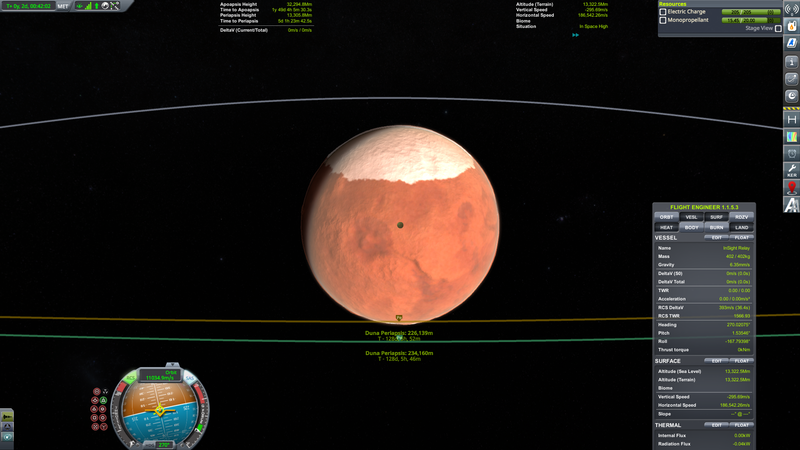 The lander must be launched into LKO with a rocket, and then use a transfer stage to get to Duna. 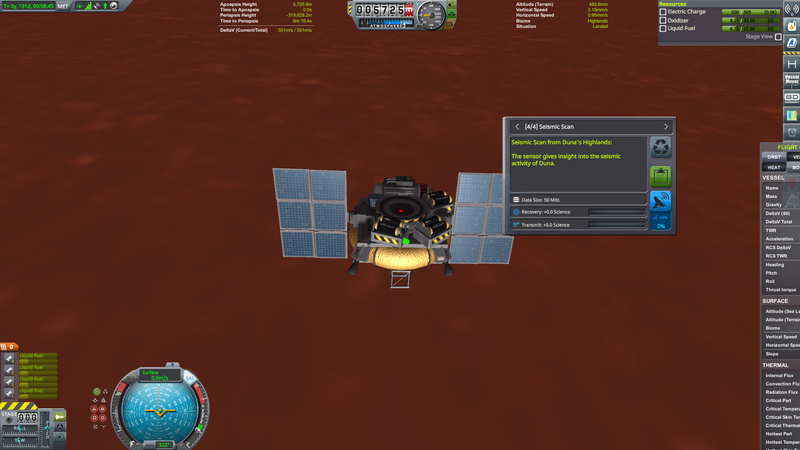 Meet Rank 1, plus the following changes: The lander only needs enough antenna power to reach Duna orbit. Build two identical mini-satellites, with sufficient relay antennas and solar power to extend the comm network to the landing site. 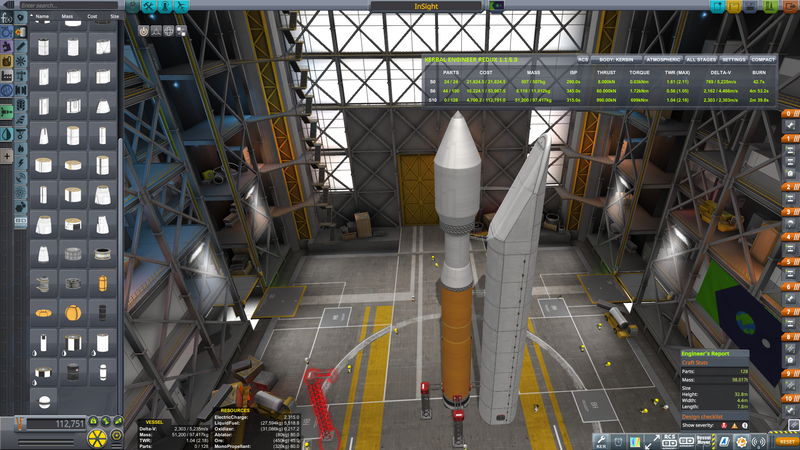 These mini-sats must be launched together with the lander, as a single payload. 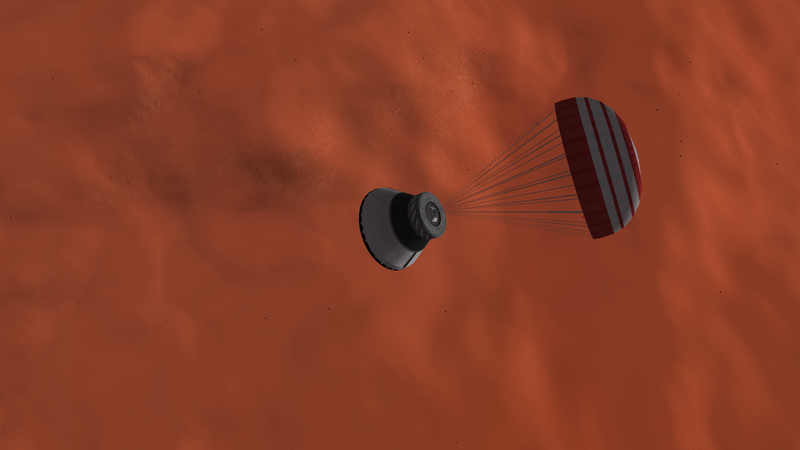 Once reaching LKO, the lander and mini-sats must all travel independently to Duna. 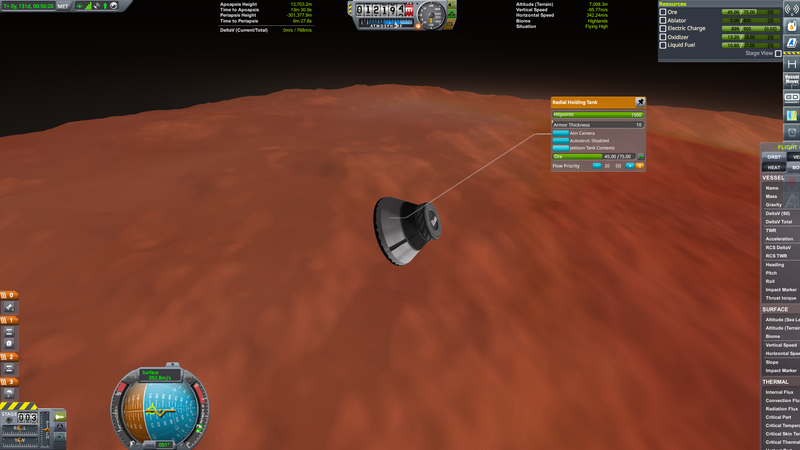 The mini-sats' trajectories should be arranged such that they perform a flyby of Duna at the correct time and place for the lander to transmit its initial data to one or both satellites. 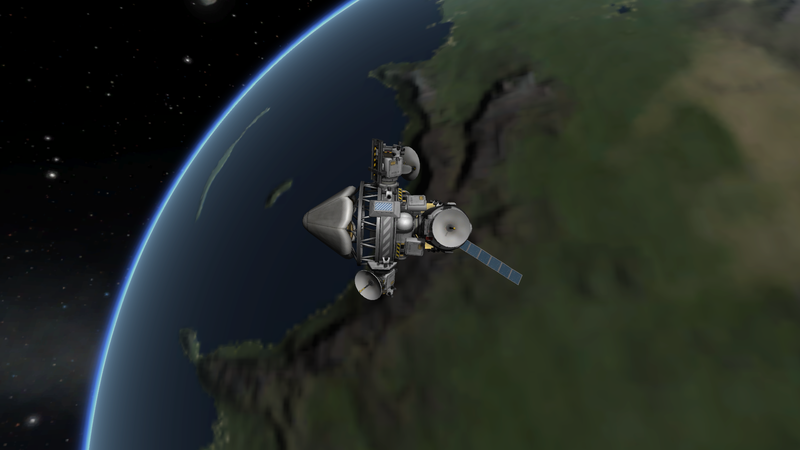 Duna Reconnaissance Orbiter: Before the main mission, launch a Duna Reconnaissance Orbiter satellite. 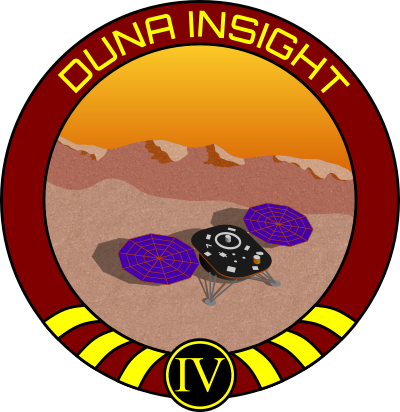 This represents an earlier mission that InSight is taking advantage of. 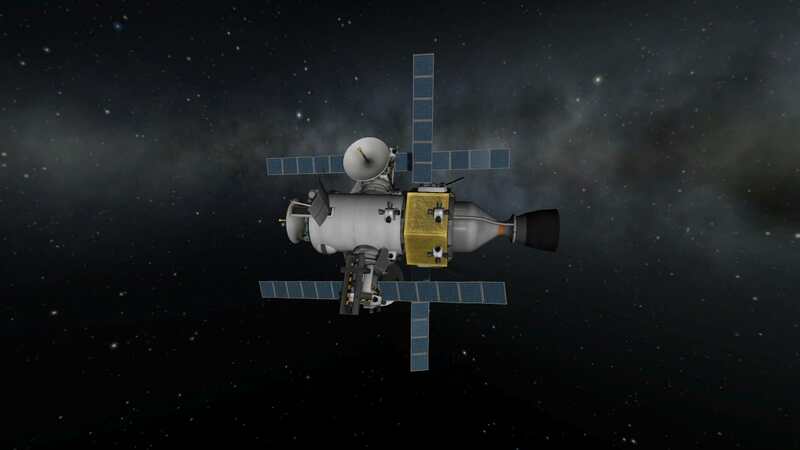 The DRO must be launched on a separate rocket and reach Duna orbit ahead of the lander, and have sufficient solar power and relay antennas to extend the comm network to the landing site. It must also carry one or more experiments suitable for unmanned orbital science (your choice). Mini-sat Extension: Extend the mission of the two mini-sats. 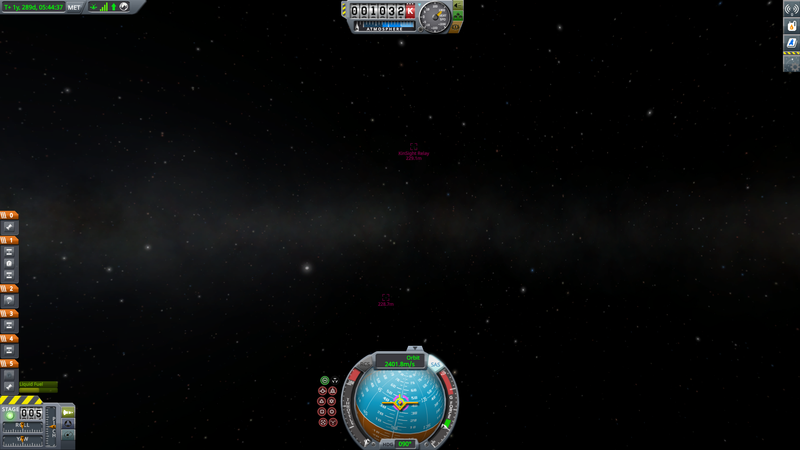 Put experiments on them and collect more science, and/or flyby additional bodies. Meet Ranks 1, 2, and 3 (at least the DRO option), plus the following changes: Do something insane. 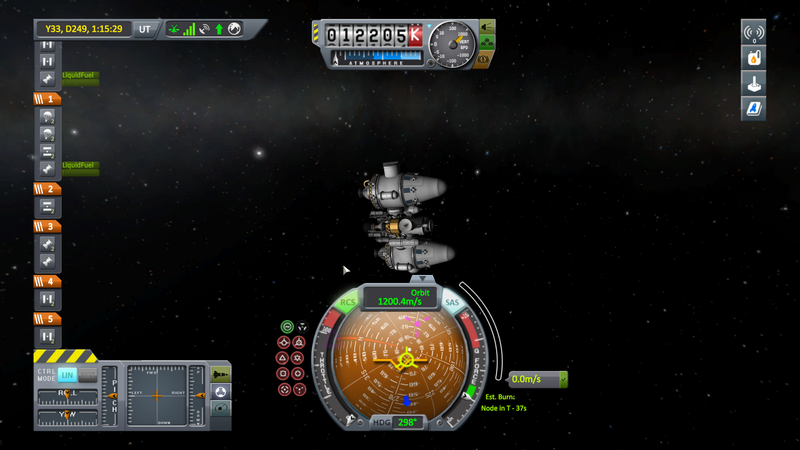 Build a Duna colony, send 100 kerbals, use an SSTA, I dunno. Impress me. But whatever you do, you may not use any additional launches; you have to piggyback on the main mission launch or the DRO launch. 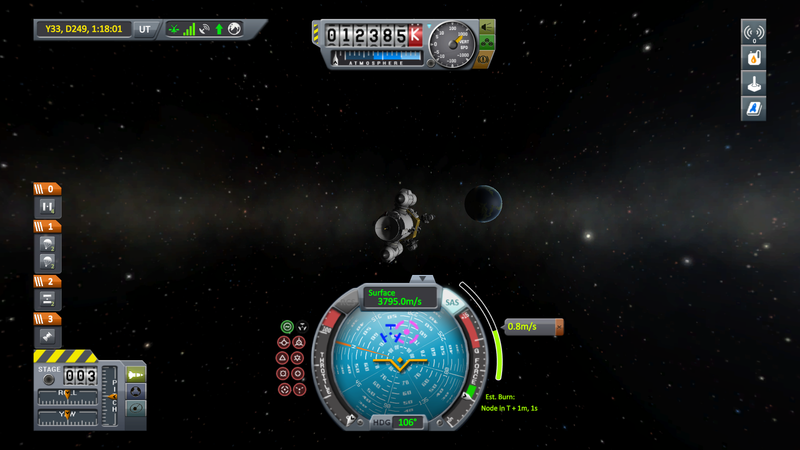 Retrieve the lander and/or mini-sats at the end of the mission. They can return under their own power, or you can launch a recovery mission, at your discretion. Compete on science, mass, cost, and dV usage. See the scoring list for details. Most scores are based solely on the entry's individual performance. Some are competitive scores, and can only be earned by one entry per category. These will be marked. Neat stuff. Might consider giving this a whirl. Question: For lowest mass, or any of the categories, do we have to activate CommNet? On the other hand, are we allowed to boost antenna ranges? I updated the rules. You need CommNet at default settings for Rank 2 and up, to show you can build a network. On the other hand, I might just check if everything works like it should, including CommNet connection before I start the challenge. So if Commnet is disabled, any antenna will do? As long as it can transmit science, yeah. I am about to start a Rank 2 attempt. 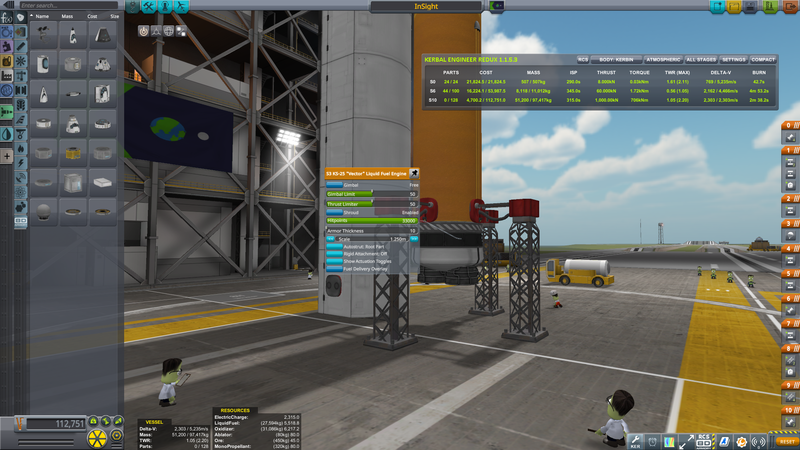 I have the craft done unless I decide to build a launch tower, but I won't be able to start for at least another three hours because I have stuff to go to... Actually, I have some homework that I should have worked on so it will probably have to wait until tomorrow. 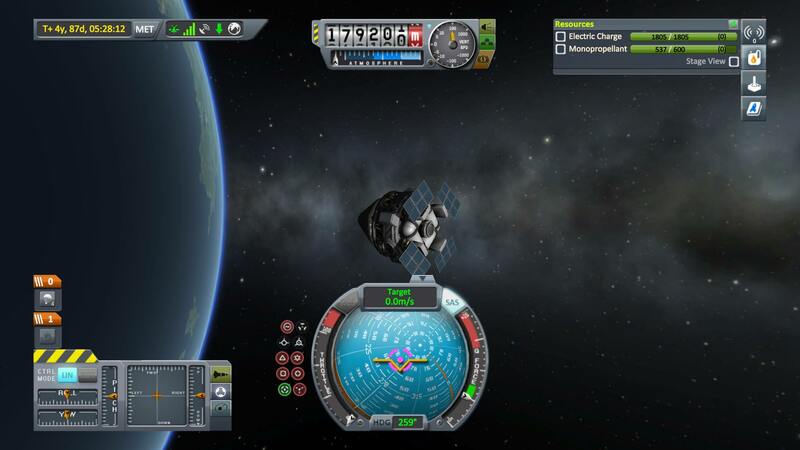 When I'm able to get to my KSP computer I just realized I need to make a change to my cubesats. The problem is that there aren't any relay antennas that are small enough yet powerful enough. A check of the wiki reveals that when calculating the whole "relay" thing, if you're bouncing through a relay the direct antennas on that relay are not being calculated, apparently, which means at minimum I'd need an RA-2 per relay, which are larger than they look... And I'd probably need two per relay to have a better shot at getting coverage. 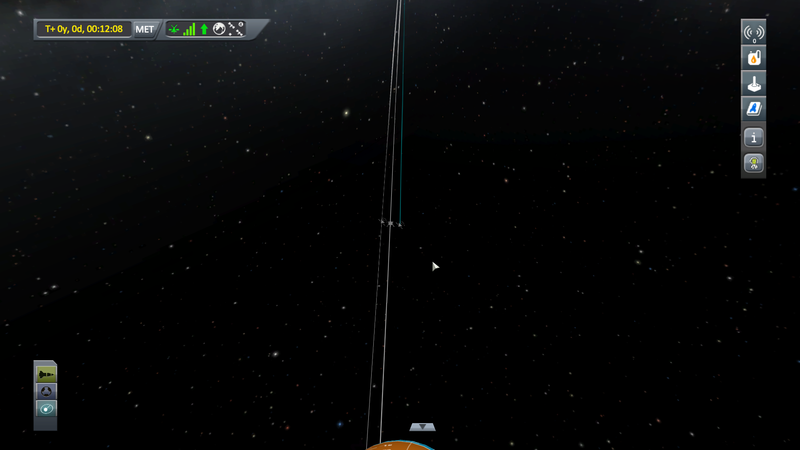 And yeah, relay antennas are pretty big for a cubesat, even the HG-5. 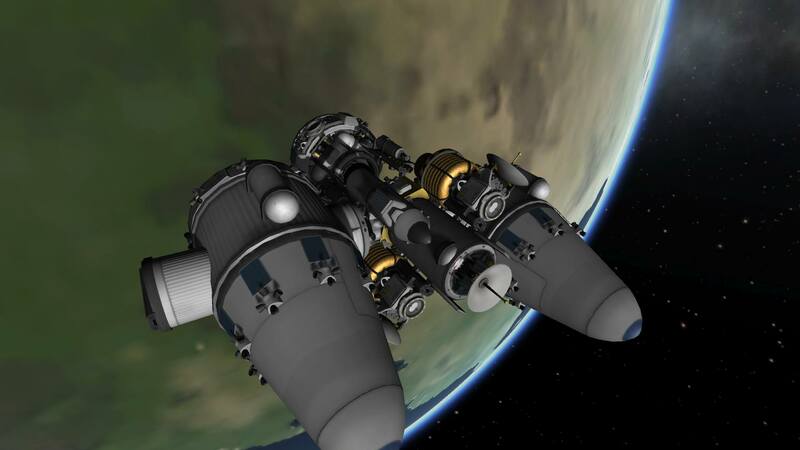 I packed DtS-M1 on both, and they connected to Kerbin but communotron 16 on the surface had issues even with home above the horizon. Gotta test it more. I'm throwing together a Rank 2 certification mission. 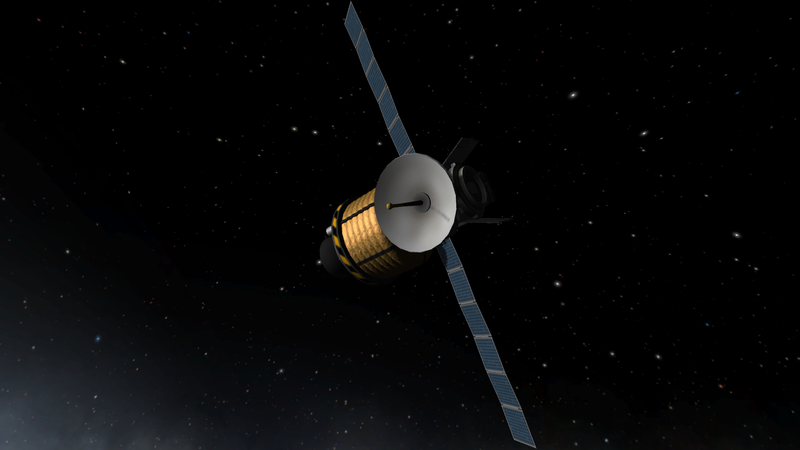 So far I have a mini-sat based on the QBE probe core with 2 RA-2s on it, which should be fine. 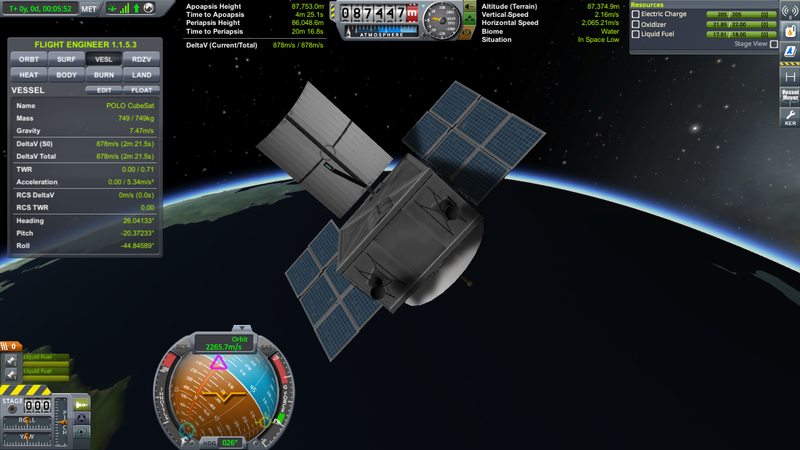 It's bigger than the real CubeSats by a fair bit, but that's the way it goes. For my lander I'm using some Near Future parts - so far it's looking fairly close to the real thing. 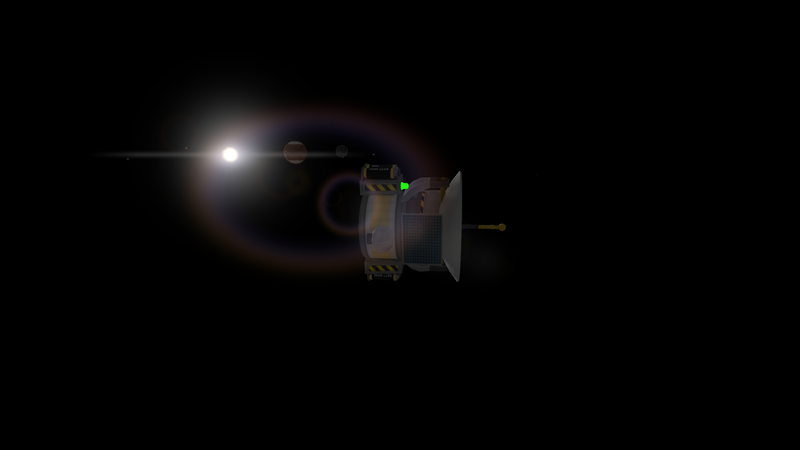 The Communotron 16 is definitely not going to cut it for direct transmission to Kerbin, but it should be able to reach an orbital relay. For direct transmission you probably want a DTS-M1 or HG-55. 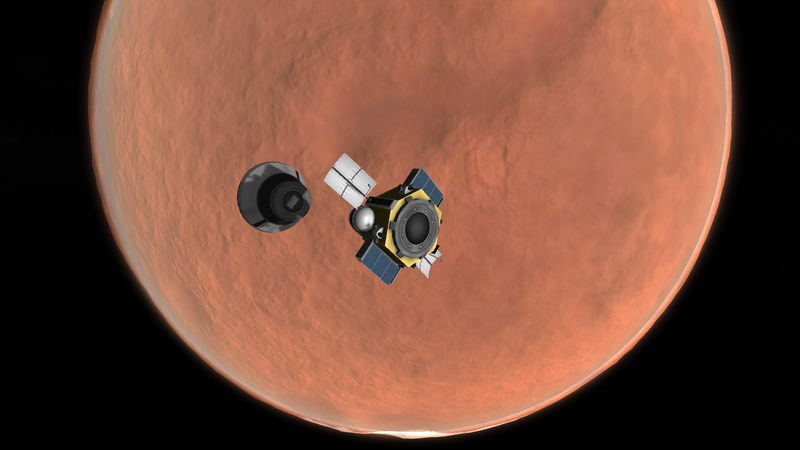 And yeah, the real mission has the MRO for a relay, but the reason they sent the CubeSats was because the MRO was going to be mostly on the far side of Mars when InSight first landed, and they wanted to get the data sooner. Congratulations to @PrvDancer85 for completing the first entry, and on console no less! I guess I need to get those badges made ASAP... I should have time this weekend. 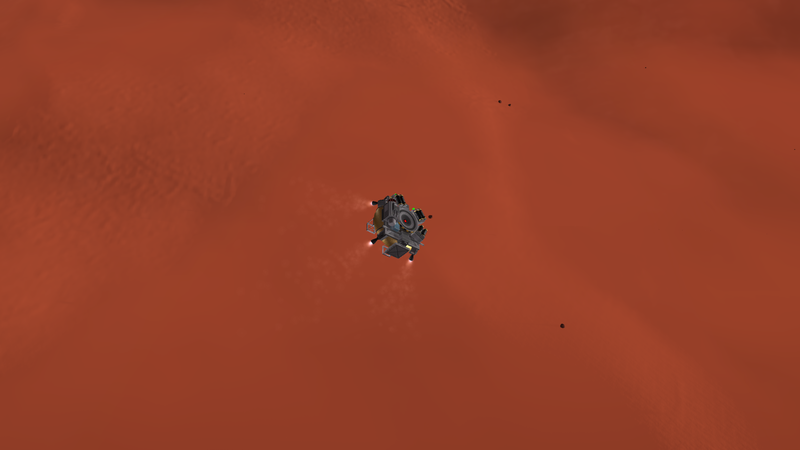 Do the mini sats have to fly to Duna separately from the main lander or does independently just mean no second launch tugs? So far I have a mini-sat based on the QBE probe core with 2 RA-2s on it, which should be fine. It's bigger than the real CubeSats by a fair bit, but that's the way it goes. Considering that even just the OKTO2 probe core alone is both bigger and heavier than the actual MarCO cubesats, that's pretty much unavoidable with stock parts. Unless you tweakscale them down to a tiny fraction of their normal size, at least. But it's still several times bigger than the real ones, and over 50 times(!) heavier. 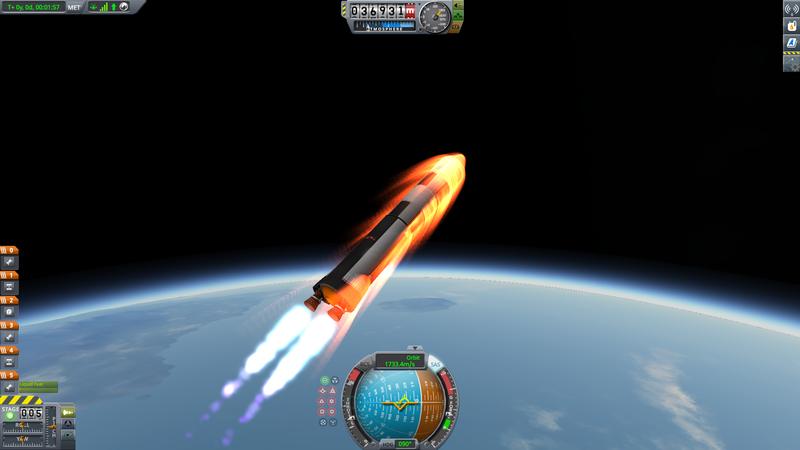 Stock KSP is roughly 50s - 80s tech I'd say. But this is a brand spanking-new mission, so it's no surprise that miniaturization has improved that much. I mean, your average smartphone has more computing power than the entirety of NASA when we landed on the Moon. Alright, my submission is complete! 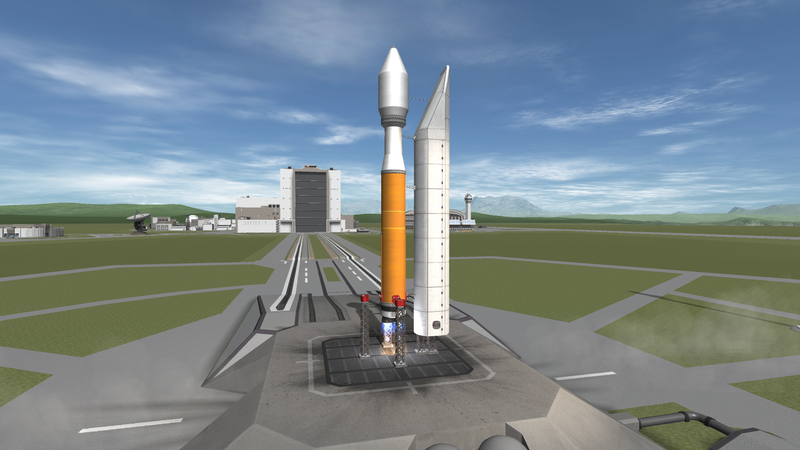 This is my Atlas-V ish. This picture is before a few of the edits, but nothing major is different between this and the final version. Ignore the Delta-V readout, it's taking into consideration launch clamps and stuff for some reason. 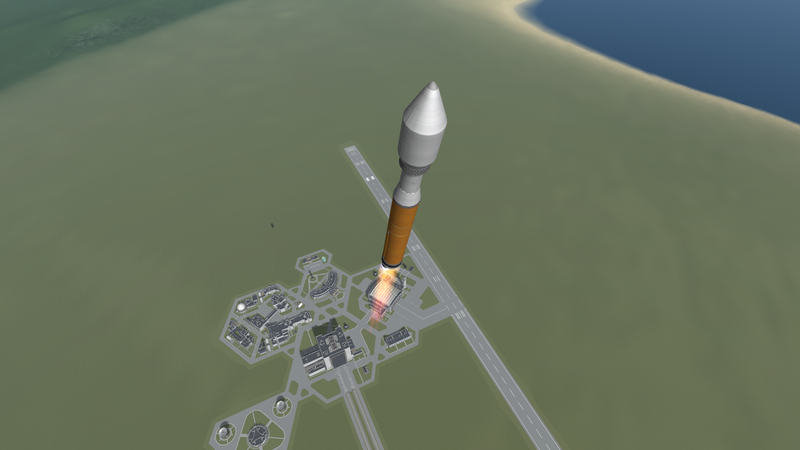 There was a little bit of part clipping done but nothing major, nothing that would change the performance of the rocket too much. The clipping I did was just for aesthetics. 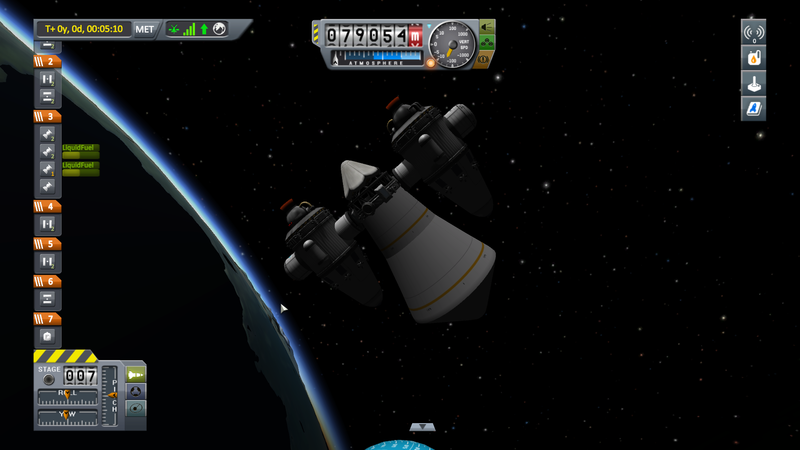 My Centaur-ish has some Oscar-B tanks inside the aesthetics-only fairing to enhance the fuel load. Looking back I realize that those cubic struts are completely unnecessary as I could have just attached the Oscar-B's radially. The RD-180 engine is simulated by two Vector engines adjusted to have half thrust and half gimbal range. The main stage also has some oxidizer drained so it has some liquid fuel left over (extra dry mass) to make performance similar to the real thing. Without that it would SSTO. 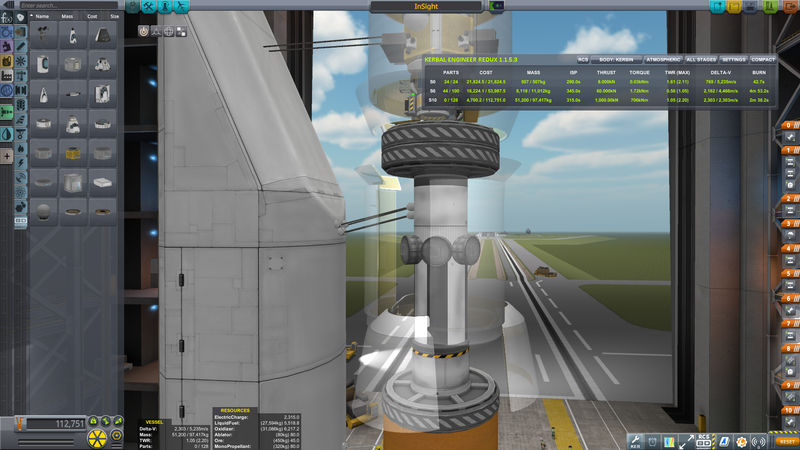 Engine ignition on the launch pad! 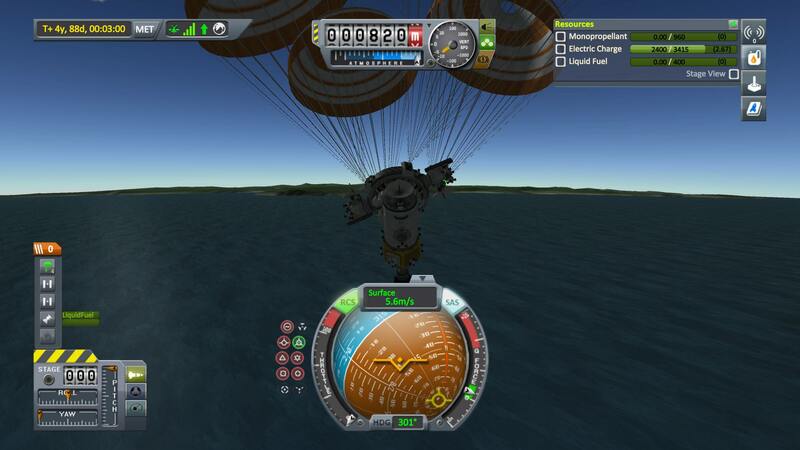 And liftoff! 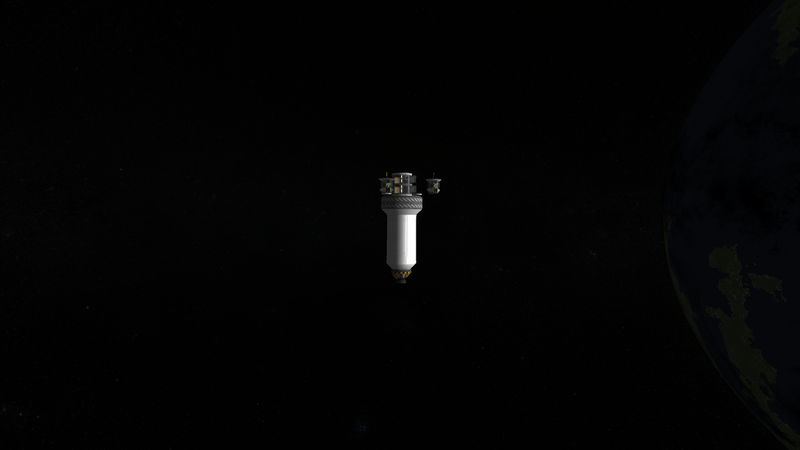 The real InSight launched into a polar orbit, but I tried that and... Ugh... Polar interplanetary transfers are the worst, especially when doing a faster than usual transfer to maintain comms range with a limited Delta-V budget (not helped by the fuel penalties of polar orbits). 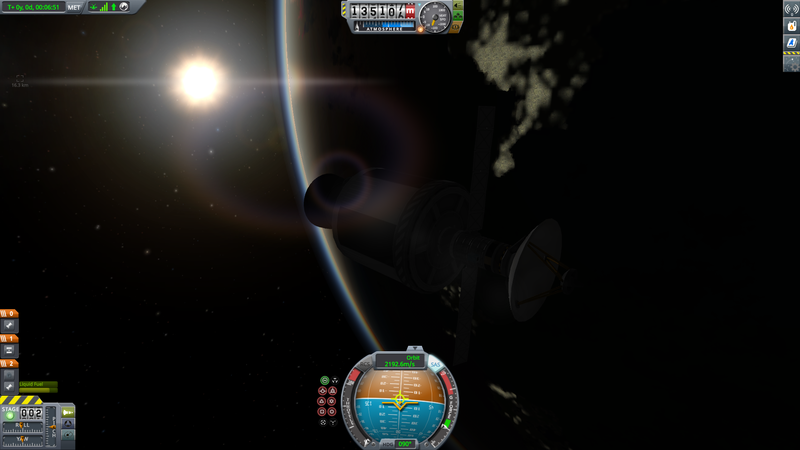 I spent around half an hour trying to get that transfer to work before starting over and going to an equatorial orbit. 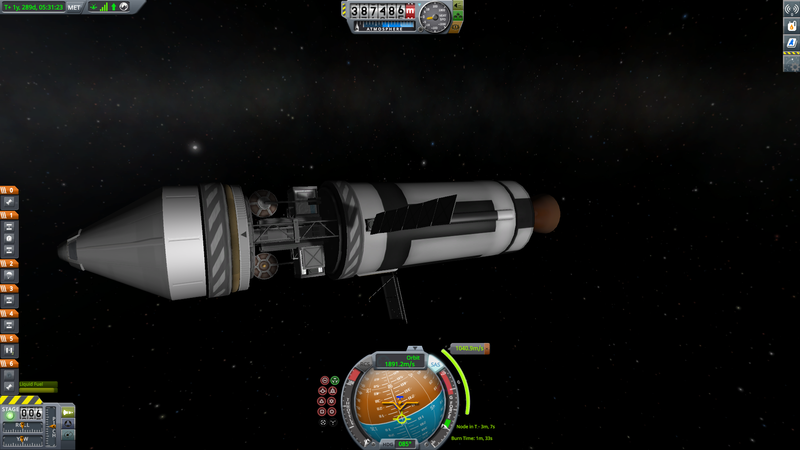 Due to atmospheric heating, the fairing is jettisoned pretty late. I also throttled down the main stage, something that I don't think would happen in real life. 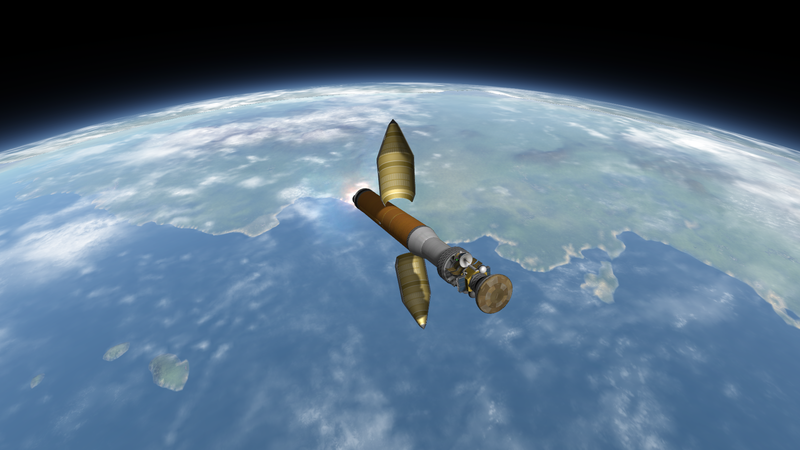 The first stage has dropped away, and the Centaur ignites very briefly before cutting off, waiting to circularize. Now we can get our first look at the spacecraft. The only non-replica section is the middle bit. Those service bays were spacers for an earlier version of the Mars Cubesats, which had to be canned due to the lack of relay power. The newer versions barely fit in the original cargo area (after opening the doors) so I didn't bother replacing the spacers. 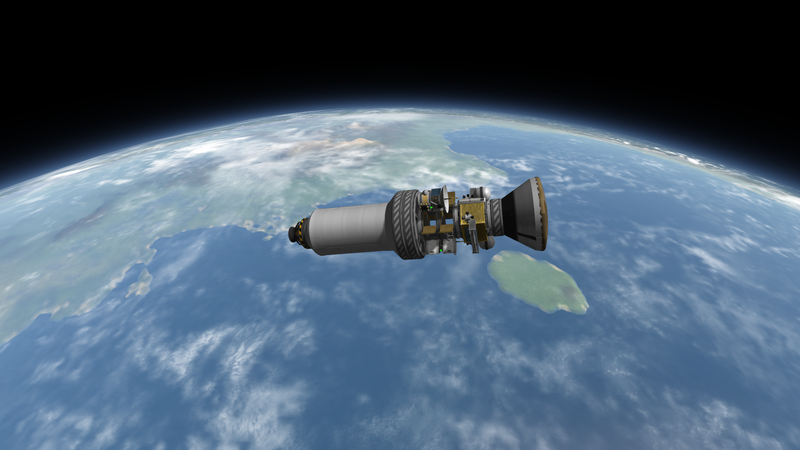 On the real mission the Cubesats were, I think, stored near the base of the Centaur, but I can't do that because KSP doesn't offer Cubesat sized parts. 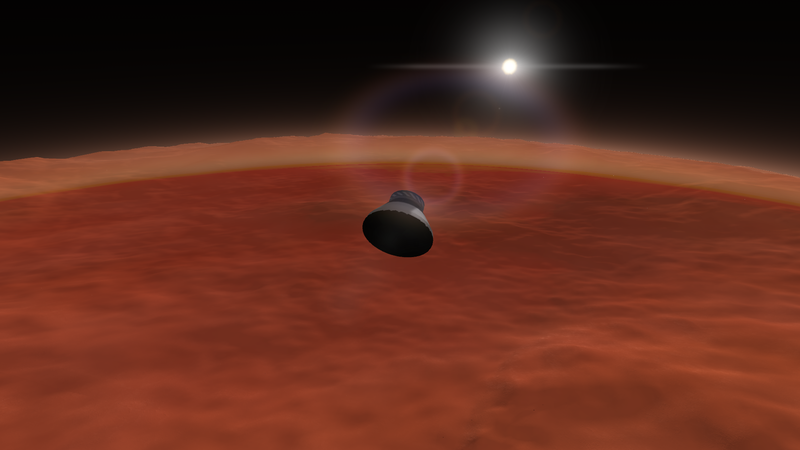 Shortly after reaching orbit, the Centaur ignites again to put the spacecraft on a course for Duna. 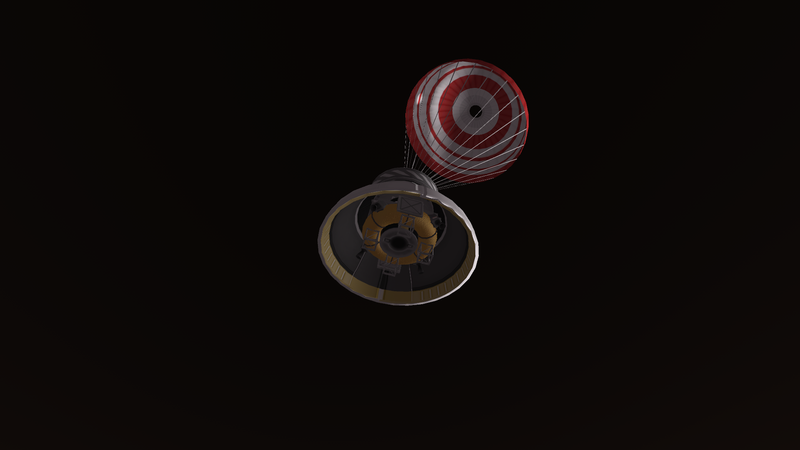 A few minutes after the end of the burn (waiting for daylight) the InSight spacecraft separated from the Centaur. 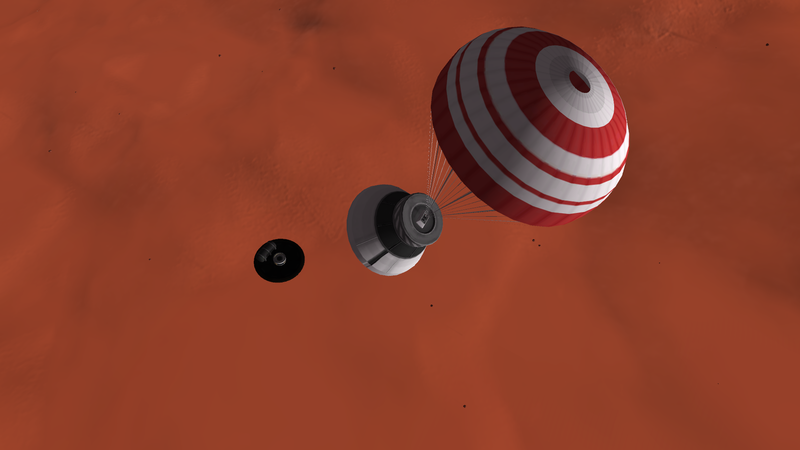 Moments later, the two Duna Flyby Relays detach from the Centaur. 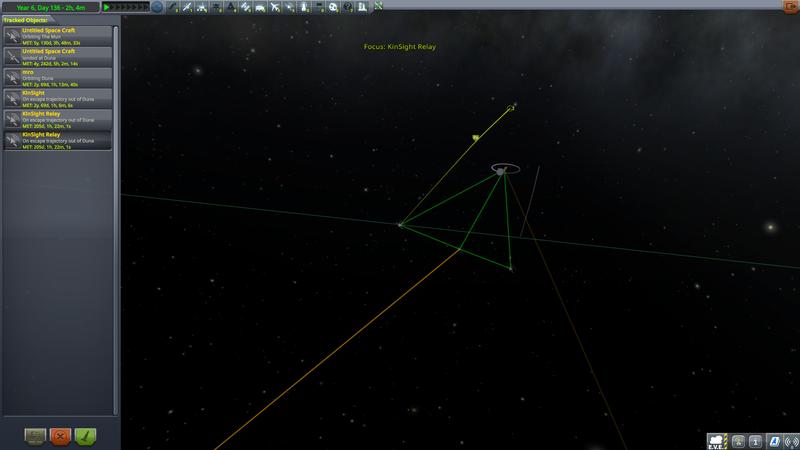 The Relays adjusted their relative velocity to the lander to be near zero, and then nothing happened for a few days. 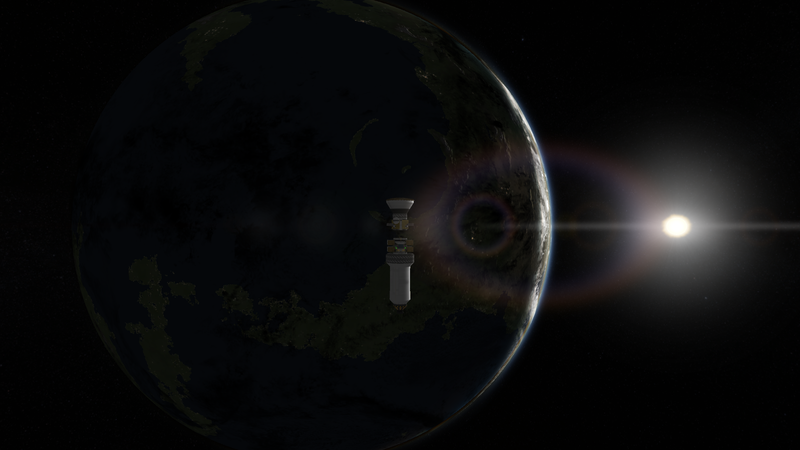 After leaving the Kerbin SOI, one of the relays made an adjustment. This adjustment was made so that the relay would be six minutes behind the lander, providing relay capability later in the mission. Ideally it would have been longer (10 minutes) but it was getting frustrating so I let it pass. 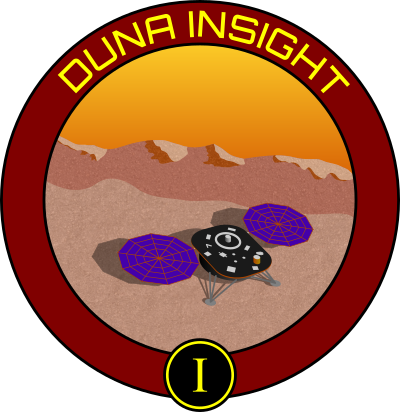 About 130 days into the mission, the InSight spacecraft makes one course correction, which puts its periapsis between 9 and 10 kilometers. 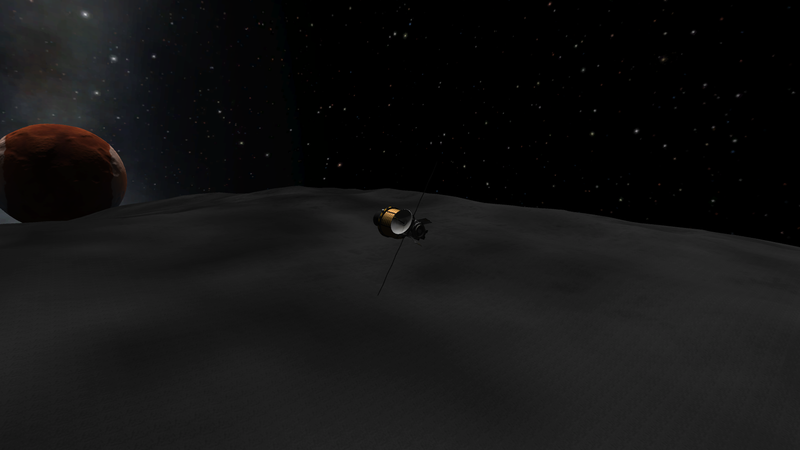 Two minutes before periapsis, the lander separates from the cruise stage and connects through the first of the two relays. The flames start pretty quickly and are pretty intense. There is an ore tank on the top side of the heat shield to produce an offset center of mass to make the whole spacecraft act sort of like a wing. 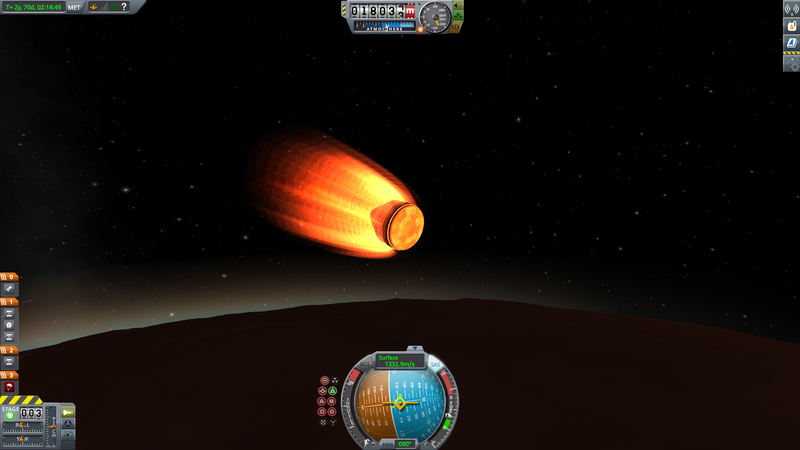 A few seconds after this picture was taken the ore was jettisoned and the craft naturally pointed towards retrograde instead of about 12 degrees above it. 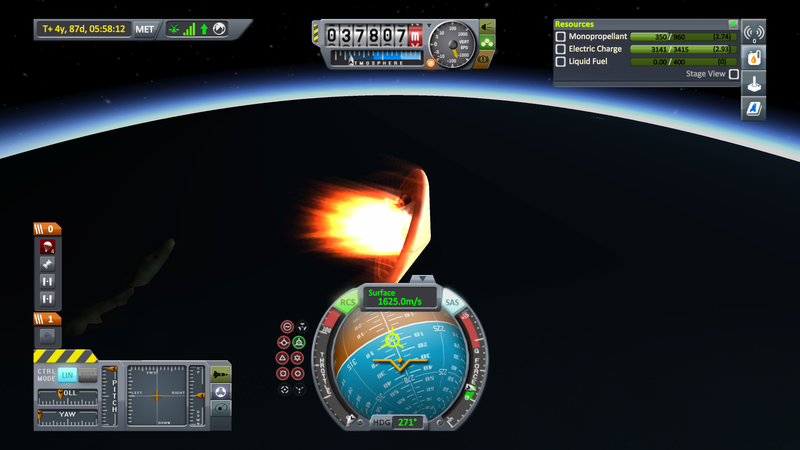 Shortly afterward the heat shield was detached. You can see the ore tank there. 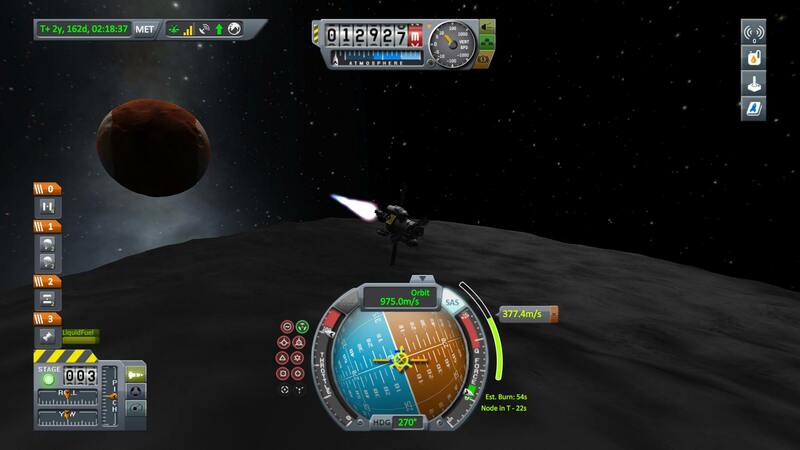 This is our first glimpse of the lander. 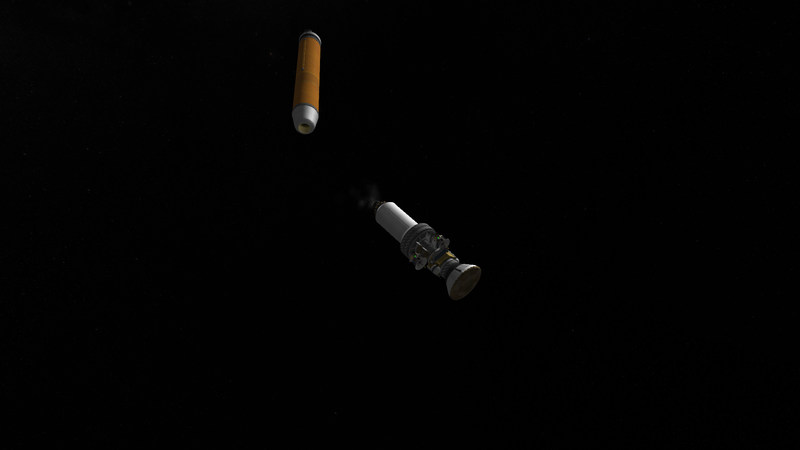 And here is backshell separation. 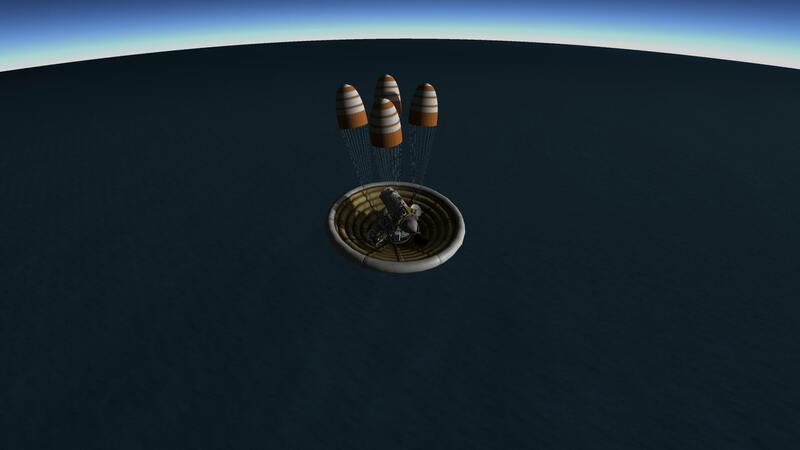 Ideally the fairing would stay intact but during Kerbin testing I couldn't get the lander to come out of the intact fairing for some reason, so we detach it here. InSight briefly turns sideways to avoid boosting back into the backshell, something the real InSight really did IIRC. 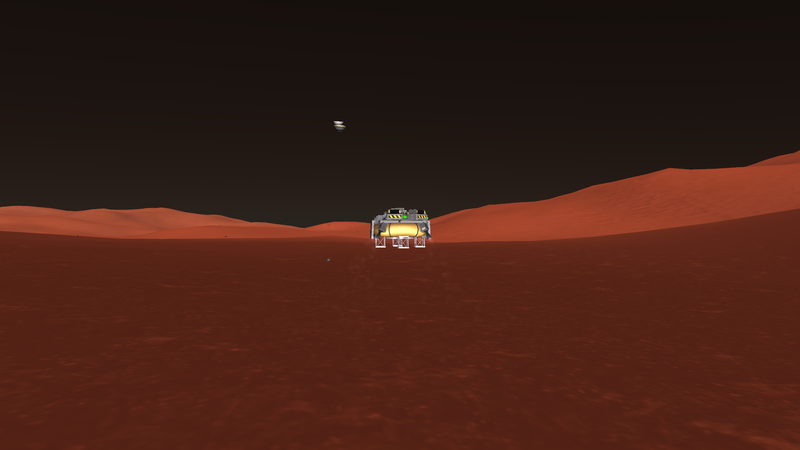 Taking some time hovering, so our backshell and heat shield actually land before us. And we are landed! The four experiments are done, but we could only transmit three on battery power so we had to wait a few minutes for the sun to rise in order to transmit the gravity scan. At the time of the last transmission, the second relay is at 57% signal. 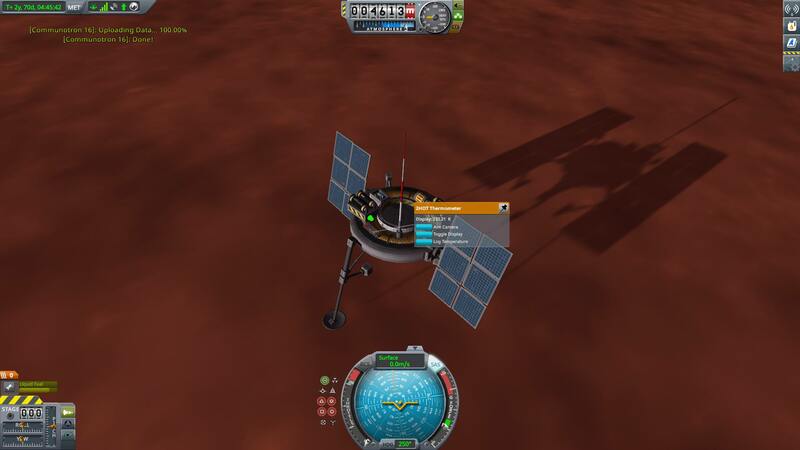 There is one of the small atmospheric antennas on this lander. 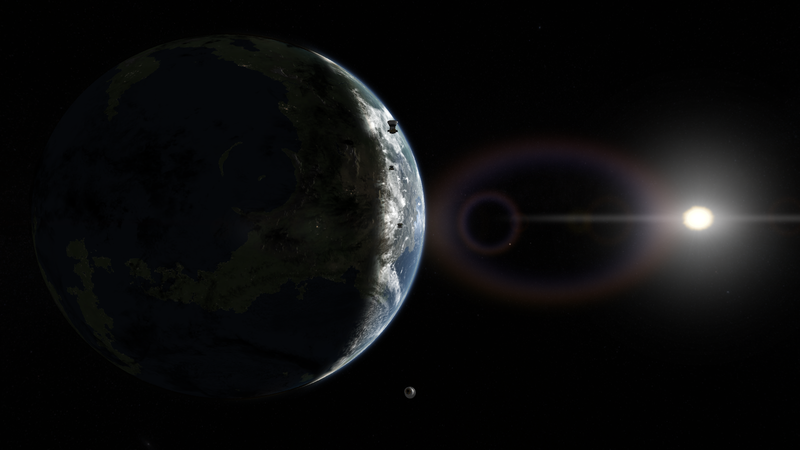 And a farewell image from the second Relay! I'd call that a complete success! That's a nice looking mission, @Ultimate Steve! I'll add you to the leaderboard. 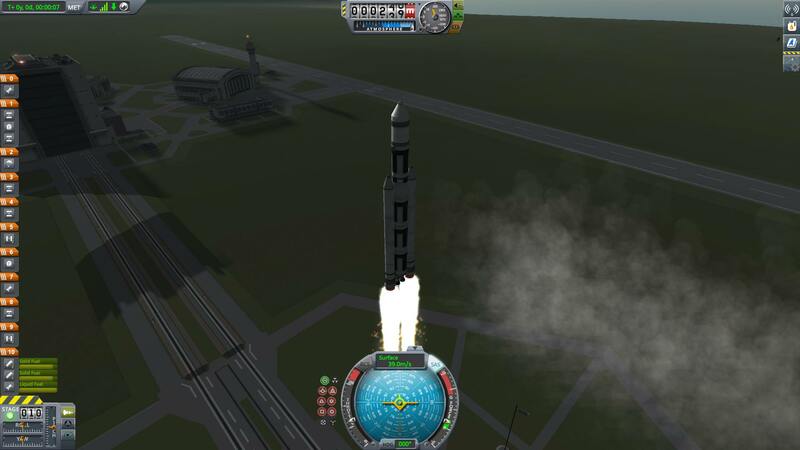 Each craft shares a single launch vehicle to get to space. 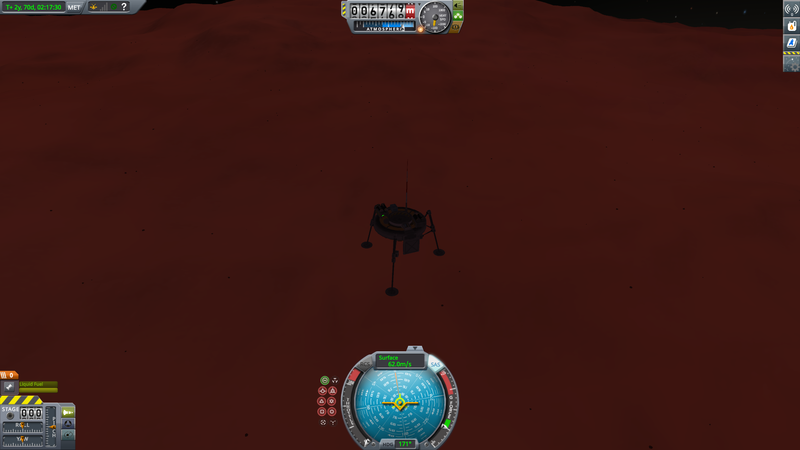 After that, they must separate before heading to Duna. 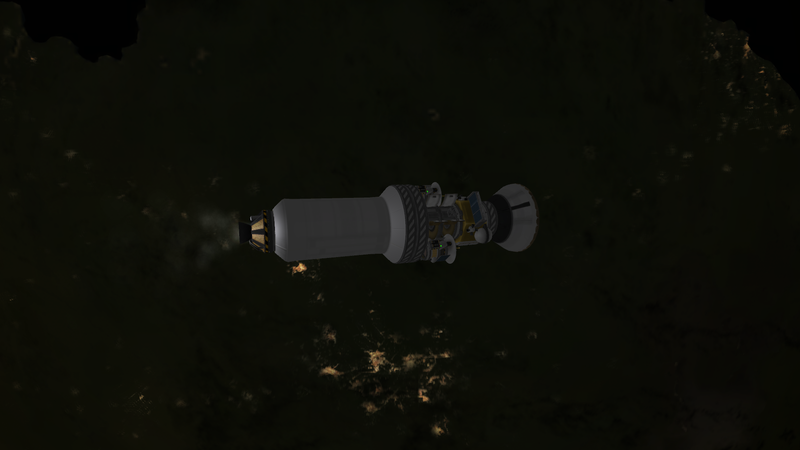 The real life mission used a shared Centaur transfer stage for the main transfer burn near Earth, and then each craft detached and did minor course corrections on the way to Mars. Ultimate Steve used a similar method for his submission. You can do that if you want, or you can use individual small transfer stages if you prefer. (Honestly that's probably harder, and will definitely use more mass overall, but whatever.) 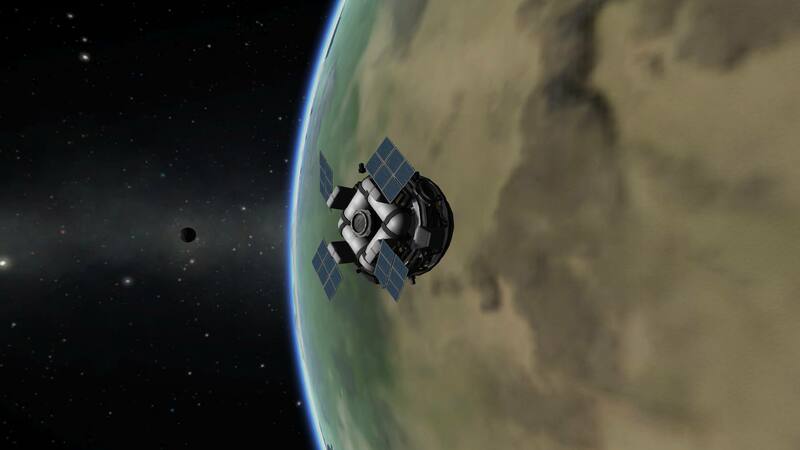 The important thing is that each craft is independent before they leave Kerbin SOI. 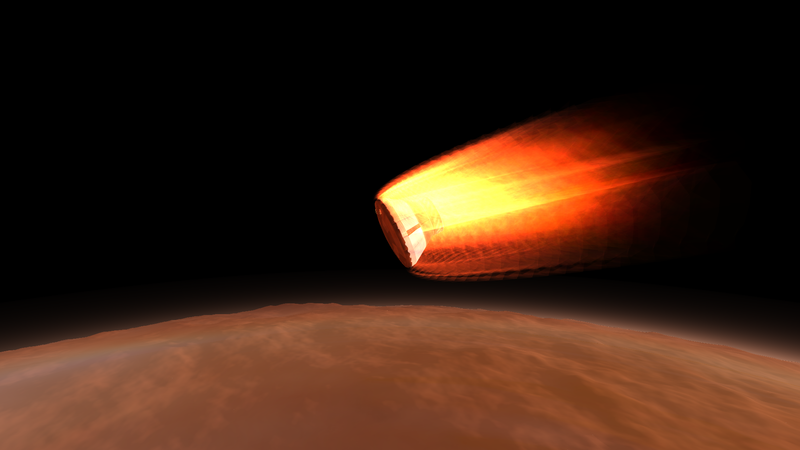 Well I had a wonderful Journey with my Duna Insight. It was a pain to plan out and execute being that I'm a console player but I had just enough Delta V to accomplish exactly what I wanted. Remember this? It's been waiting in orbit the whole mission for one very specific reason. 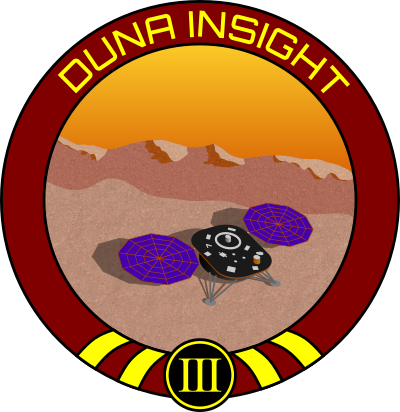 We'll be recovering the InSight and both Sats with it. 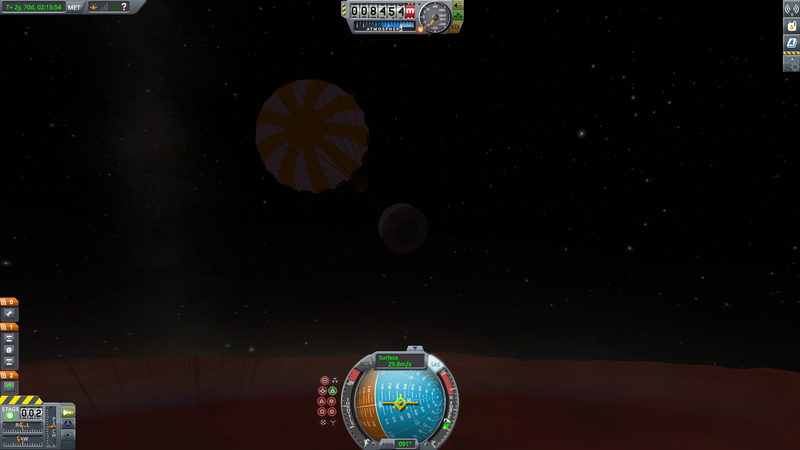 De-orbited with RCS and inflated the heat shield. Kept RCS enabled to stay pointed mostly retrograde since we were slightly unbalanced. 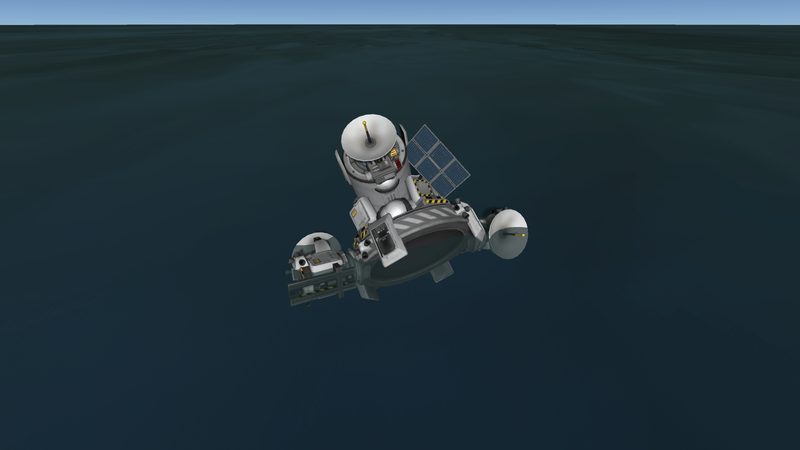 Successfully touched down in the waters of Kerbin. 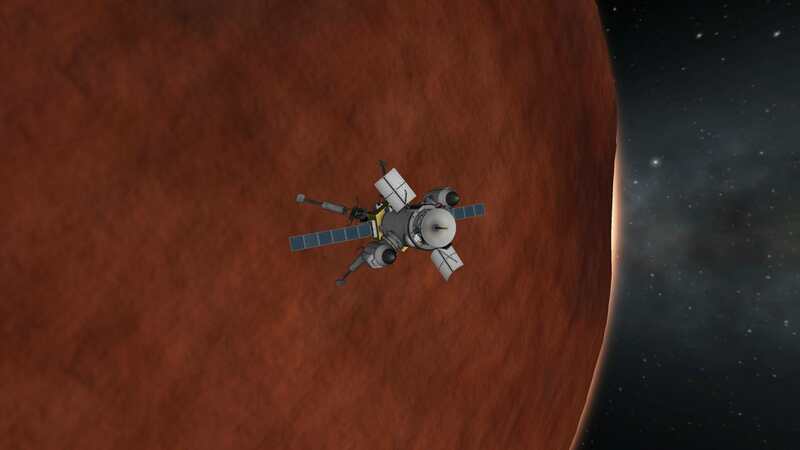 My InSight and it's Sats traveled to Duna, completed the mission, and came back home safely. Two very cool submissions from @Will-ferret and @Xurkitree, nice work kerbonauts! I'll update the leaderboards in a bit. 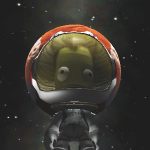 Will-ferret, next time please try to get a better screenshot of the science modules. I did see them, but I had to hunt around and zoom in a bit. And after. 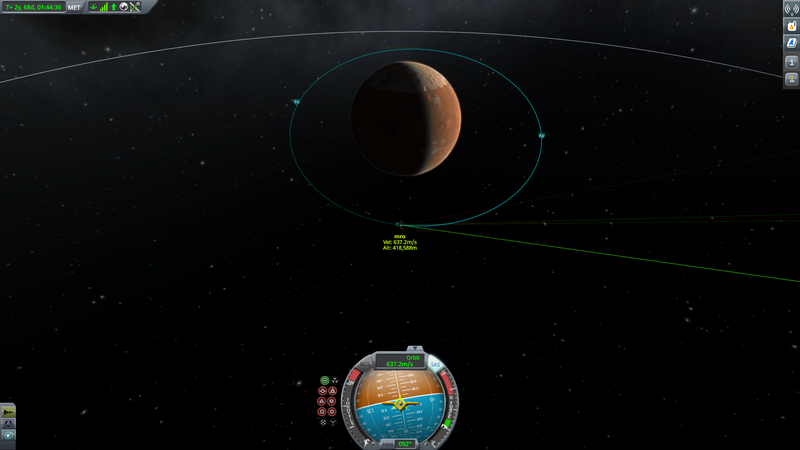 I could probably lower the decoupler power because they ended up pretty far away by the time they reached Duna. 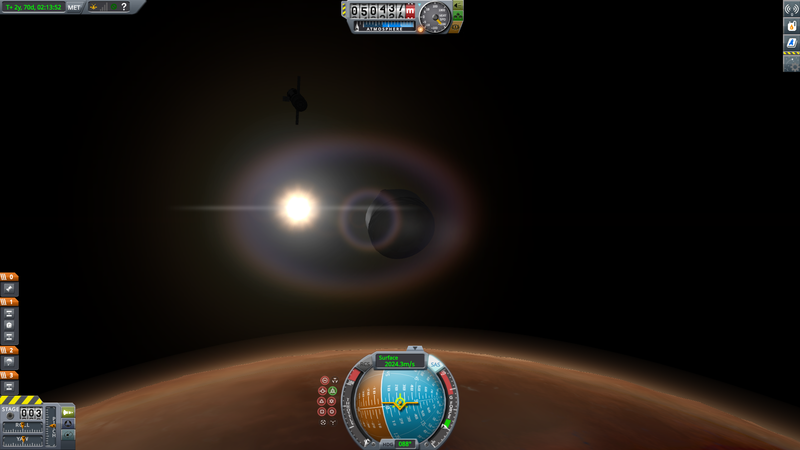 Detached chute, going down only on engine power (still limited to 100%/off) - DRO was below the horizon, bad timing, and for some reason I couldn't catch the signal from cubesats, even though they were totally connected when they reached Duna SOI. For some reason I did not take a picture but I mounted some science experiments on DRO, and that one had even more EC to perform and transfer them back home. Looks good @The Aziz, but I'm on mobile for a while. I'll take a closer look and update the scores when I get home.